Golf Cart Lithium Battery - Better than Lead Acid Batteries? 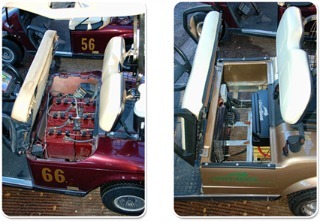 Wondering how a golf cart lithium battery works? When it's time to replace your lead acid batteries should you consider going with a lithium one instead? John Salisbury from LithiumBoost.com shares with us the benefits of a lithium battery over lead acid batteries. 1. Explain how lithium batteries work in electric golf carts. Lithium batteries replace the lead acid batteries that have historically been used; they provide the same voltage, so no modifications of the cart's electrical drive system are needed. 2. How are lithium batteries different from lead acid batteries? Instead of using heavy lead plates and acid electrolyte, they use a light weight Lithium/Carbon anode and and Lithium Iron Phosphate cathode, the same formulation used in the new electric vehicles such as the Nissan Leaf, and Chevrolet Volt. 3. What are the benefits of lithium batteries? They last longer, with the capability of 2000 or more charge / discharge cycles; this means that they will last many years for the typical user. They are much lighter, saving as much as 400 pounds, and more compact, allowing for left over space that can be used for storage. They are clean, with no acid spillage or fumes that can occur with lead acid batteries. 4. What kind of maintenance do lithium batteries require? The batteries are maintenance free, with no watering required and they do not cause corrosion on the cables either. 5. How does one convert their electric golf cart from lead acid to lithium batteries? Can a golf cart owner do it himself or does it need to be done by a golf cart dealer? Conversion is normally done by a dealership technician using our simple instructions. The Lithium cells, charger, and our battery management system drop into the location that the original batteries occupied, with space left over. 6. Can lithium batteries be used in any electric golf cart make, model or voltage? Our basic system is designed to work with any 36 or 48 volt cart, and features 60 amp hour cells which are suitable for most needs. For heavy applications and/or for longer driving range, larger 100 and up to 200 amp hour cells are available. That makes them perfect for golf carts, utility vehicles and even off road carts! How Do They Compare To Lead Acid Batteries? 7. What is the cost of lithium batteries and how does it compare to lead acid batteries? Initially the cost is higher, but the benefits of performance, long lasting system, and reduced weight make it a very cost effective solution for the overall longevity of the vehicle. Our VP of Sales Roger Manusov works with dealers on the pricing of various system configurations. 8. How often do they need to be replaced? The cells last in excess of 2000 charge / discharge cycles; that translates to many years, depending on usage. 9. If someone is interested in getting more information or changing their golf cart batteries to lithium batteries, who should they contact? For more information call 1-800-280-0943 or email us at info@lithiumboost.com and a representative will get in touch with you.